Mayor Bill de Blasio’s office gave the greenlight for the BQX streetcar this week, releasing a new report that detailed a slightly shorter route for the Brooklyn Queens waterfront light rail. In this new report, which was released by the mayor’s office last week, the project will skip the Sunset Park stop. According to the report, the route will connect Astoria, Long Island City, Greenpoint, Williamsburg, the Brooklyn Navy Yard, Downtown Brooklyn and Red Hook. In the original report, the Brooklyn routes were determined, but the route the streetcar would take to get to its Queens locations was not stated. Since its announcement in 2016, little has been revealed about the nearly $3 billion project. When it was initially announced, the project was expected to pay for itself through a method known as “value capture,” which would create tax revenue for the city through the private investment of the area surrounding the route. De Blasio noted that the next phase of the project will be an environmental-impact study this winter, which will be followed by the Uniform Land Use Review Procedure (ULURP) in 2020. He anticipates that construction will begin in 2024 and end in 2029. While discussing the value-capture concept, the mayor said that “there will be some real funding created by its presence,” but added that the project would also need federal funding. “I don’t think it’s doable without federal support, but we’ll speak to the details,” he said. Regarding federal budgeting, the mayor believes that if Democrats win more seats in the legislature in November, this would lead to increased allocations towards the city’s Northeast Corridor and the BQX. 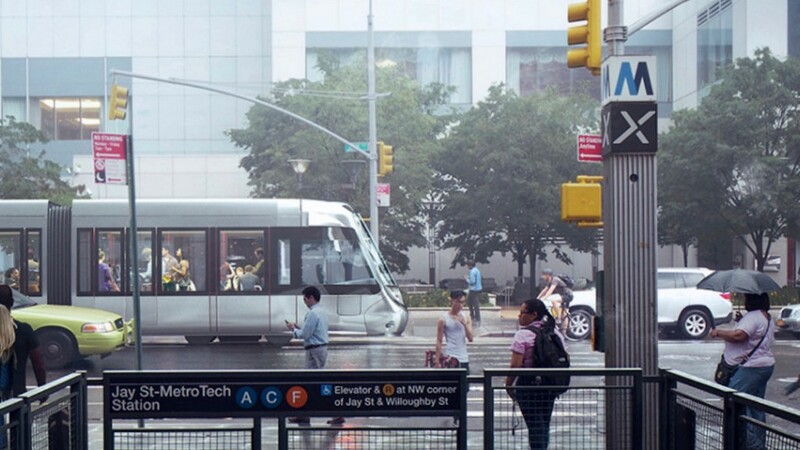 City Councilman Carlos Menchaca (D-Brooklyn), chairman of the City Council’s BQX taskforce, said that he is skeptical about the need and payment method of the light rail, even after seeing the new proposal. Menchaca believes that the city’s Economic Development Corporation has not established the need for the streetcar.